The Nelson Brothers announce The Ricky Nelson Remembered Tour starring Matthew & Gunnar Nelson and The Stone Canyon Band will be coming to the famed Boardwalk for six shows June 1-5, 2008 to the Atlantic City Hilton. 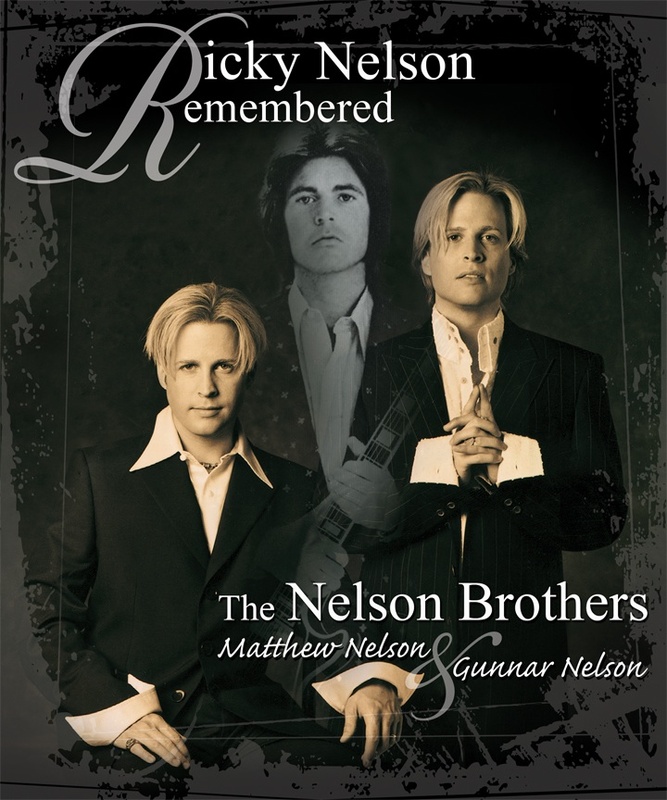 The Nelson Brothers announced today The Ricky Nelson Remembered Tour starring Matthew & Gunnar Nelson and The Stone Canyon Band will be coming to the famed Boardwalk for six shows June 1-5, 2008 to the Atlantic City Hilton. Matthew Nelson and Gunnar Nelson are the identical twin sons of Rock'n'Roll Legend Ricky Nelson, of rock group NELSON whose pop/rock #1 hits include "Love and Affection", "After the Rain", and "More Than Ever" will perform at 7 p.m. nightly on Sunday, June 1st, through Thursday, June 5th with one matinee show performance on Tuesday, June 3rd at 2 p.m.
"Ricky Nelson Remembered" is a unique tribute to their late father's popular music including all his chart topping famous hits such as Ricky Nelson's "Travelin' Man", "Hello Mary Lou", "Poor Little Fool", "I'm Walking" and "Garden Party". The full production show starring the grandsons of TV's Ozzie & Harriet Nelson also features a unique "Nelson Family" visual experience. "On a musical level, we love performing the Ricky Nelson classic hits... the songs are legendary for a reason: they're wonderful songs," says Matthew Nelson, "And at the same time, on a personal level, performing his music on this tour makes us feel closer to him with every show." "Since our father's music was documented on TV for 15 years on the Ozzie and Harriet show, it only made sense to finally incorporate his pioneering video moments into this live concert," adds Gunnar Nelson. "It's taken the show and transformed it into an experience... and the audience feels like they're right in the middle of the action." When Matthew and Gunnar, the twin grandsons of TV's Ozzie & Harriet Nelson, scored their own #1 billboard hit, "Love and Affection", it landed the Nelson family in the Guinness Book of World Records as the only family in entertainment history with three successive generations of #1 music hits. The "Ricky Nelson Remembered Tour" starring Matthew & Gunnar Nelson and The Stone Canyon Band is scheduled for Sunday, June 1st through Thursday, June 5th at the Atlantic City Hilton with shows nightly at 7 p.m. featuring songs of Ricky Nelson, and a special matinee show on Tuesday, June 3rd at 2 p.m. Tickets are available through the hotel box office or by calling Ticketmaster 1-800-736-1420 or visit http://www.ticketmaster.com. Visit The Nelson Brothers' official website at http://www.TheNelsonBrothers.com. To arrange press interviews with Matthew and Gunnar Nelson, please contact Liz Motley at (786) 897-7414.